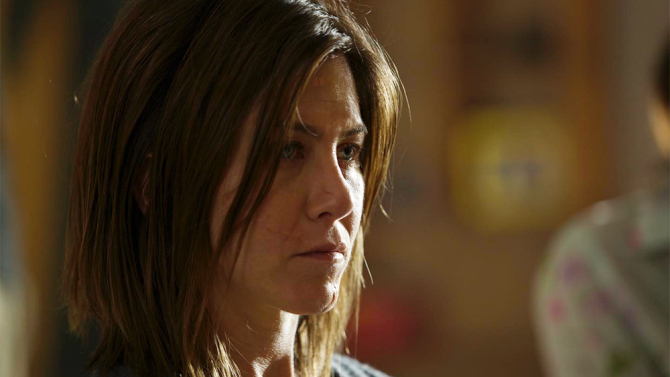 The film centers on a woman named Claire (Aniston), who is in the middle of a support group meeting for depression and chronic pain sufferers. One of the regulars in the group named Nina (Anna Kendrick) has committed suicide, and now the group must tell a picture of Nina how they feel about it. When it comes around to Claire, she lays into the deceased rather than forgiving her, which upsets the group so much that they ask her to leave. 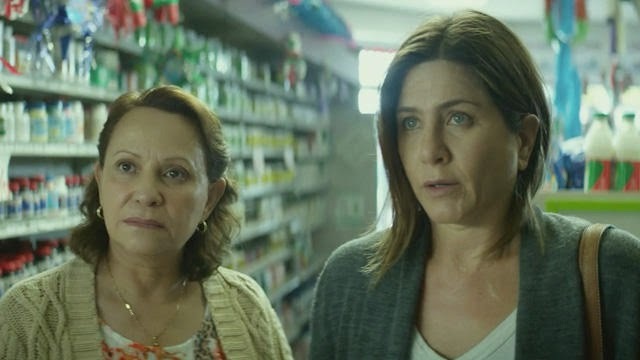 We soon realize that Claire is a completely broken woman who lives alone in her fancy Los Angeles estate, is addicted to painkillers, and is looked after emotionally by her housekeeper Silvana (Adriana Barraza). Claire’s face is riddled with scars as are her legs. Her husband (Chris Messina) doesn’t live at home anymore and there are pictures of a young boy around the house, but is deceased, probably from the same incident that caused Claire’s scars. Throughout her suffering, Claire is visited by Nina’s ghost who tries to convince her to kill herself, as Claire is not entirely sure on the idea yet. She visits Nina’s home where her husband Roy (Sam Worthington) and his young son are trying to pick up the pieces of their dead loved one. Claire and Roy try to bond over grief and try to develop an unromantic relationship, but things go sour. Claire is only kept on the semi-right track by Silvana, which is one of the better aspects of this film. The relationship between Claire and Silvana seems so real and eventually evolves from employee/employer to an actual mutual friendship over time. And you’ve never seen Jennifer Aniston like this before. Her mangled face and body, and even her inability to sit up right in a car seat are just the tip of the iceberg of her performance her. It’s an emotional roller coaster from start to finish and Aniston pulls off every emotion perfectly. It really is a shame she wasn’t nominated for an Oscar for this role. Adriana Barraza is the other light in this film who shows her exquisite talent in taking care of someone who is clearly a mess of a person, with almost no hope of wanting to get better. For those who have dealt with depression or the loss of someone close to you, I imagine some of these aspects will hit close to home and most of these instances are executed well, but there are some minor moments where things tend to underplay and not garner the specific reaction that the director wanted. That being said, ‘Cake‘ is still one of the better films to start the year off and Aniston’s performance is one for the books. « Film Review: ‘A Most Violent Year’!